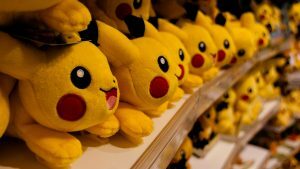 Pokémon Go: A Blueprint for Augmented Reality? July 2016, a cultural zeitgeist dating back to the 90s was unleashed upon the world with renewed and unprecedented vigour. Pokémon Go fever swept the world – at its peak in mid-July, it was estimated that over 45 million (Griffiths) users were trying to catch ‘em all. If you happen to be one of the cicadas that’s just come out of a 17 year long hibernation cycle and completely missed the Pokémon storm, fear not – I’ll get you up to speed. Niantic Labs created one of the first publicly available AR games (Statt), Ingress – a location based, massively multi-player online game with an exer-gaming component in 2012. “Ingress is a mobile augmented reality ‘capture the flag’ style of game in which players are assigned to one of two factions, the Enlightenment (green team) and Resistance (blue team). They range across the city, vying to capture ‘portals.’ The portals are associated with a nearby landmark, so players need to travel to that location to secure them.” (Goggin 8) Similarly, Pokémon trainers have to join one of three teams (red, blue or yellow) and travel to physical landmarks collecting Pokémon, takeover gyms at specified locations and battle against opponents’ Pokémon to safeguard gym territory. Granted, the game isn’t perfect and perhaps some of its problems are built-in as part of “modern viral game design”. Regardless, none of these issues could dissuade the 45 million players from giving it a go. Apart from getting people to leave their homes, venture out, explore the physical space they inhabit and socialise, Pokémon Go has introduced an unprecedented number of users to the world of augmented reality. Augmented reality entails the enhancing of a real-world scenario with elements that are created by computer. While virtual reality is based on a simulated view of the world, AR takes actual visual, auditory, and other sensory information as its foundation (Reiff). Pokémon Go has effectively made AR mainstream. 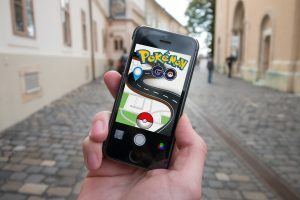 Whilst many are celebrating the arrival of AR to the forefront, experts draw attention to the fact that Pokémon Go isn’t the first to use AR and that the technology it runs on is eight years old. Pokémon Go runs on what is known as GEO AR – AR that is based on location based augmentations (Gstoll). But the franchise’s success lies in the manner in which it has designed the experience of the augmented reality it offers – built into it’s core is the notion of physical movement. One must walk or move to specific locations to catch, hatch and defend their Pokémon. Detractors, though, say that the AR function of the game is nothing more than a gimmick and when the time comes, users will realize it is much easier to play the game with AR turned off (Mayer). Griffiths, Sarah. “Has Pokémon Go’s Bubble Burst? 15 Million Players Have given up Trying to Catch ’em All.” WIRED UK. WIRED, 24 Aug. 2016. Web. 16 Sept. 2016. <http://www.wired.co.uk/article/pokemon-go-numbers-falling>. Goggin, Gerard. “Locating Mobile Media Audiences: In Plain View With Pokémon Go.” Ed. Ramaswami Harindranath and Craig Hight.Studying Digital Media Audiences: Perspectives from Australasia. New York: Routledge, 2017. 8. Print. Statt, Nick. “This Is Pokémon Go, the Ambitious AR Game Bringing Pocket Monsters to Life.” The Verge. 10 June 2016. Web. 16 Sept. 2016. <http://www.theverge.com/2016/6/10/11898470/pokemon-go-ios-android-niantic-ingress-ar-first-look>. Tassi, Paul. “How To Get Around The Most Common Bugs And Glitches Of ‘Pokémon GO.” Forbes. Forbes Magazine, 28 July 2016. Web. 16 Sept. 2016. <http://www.forbes.com/sites/insertcoin/2016/07/28/how-to-get-around-the-most-common-bugs-and-glitches-of-pokemon-go/#29c34d1210e8>. Connolly, Denny. “Pokemon Go Guide: How To Level Up.” Game Rant. N.p., 09 July 2016. Web. 18 Sept. 2016. 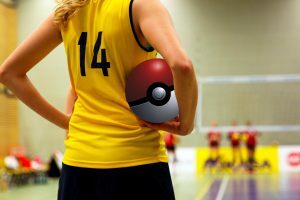 <https://gamerant.com/pokemon-go-guide-level-up-getting-started/>. Webster, Andrew. “Chatting about Pokémon Go with Some of the Top Mobile Game Designers.” The Verge. N.p., 15 July 2016. Web. 18 Sept. 2016. <http://www.theverge.com/2016/7/15/12198734/pokemon-go-designer-roundtable-discussion/in/11913005>. Reiff, Nathan. “How Pokemon Go Uses Augmented Reality.” Investopedia. N.p., 09 Aug. 2016. Web. 18 Sept. 2016. <http://www.investopedia.com/articles/investing/073016/how-pokemon-go-uses-augmented-reality-ntdoy.asp>. Gstoll, Andy. “A Love Letter from Augmented Reality to Pokémon Go.” The Next Web RSS. N.p., 19 Aug. 2016. Web. 18 Sept. 2016. <http://thenextweb.com/insider/2016/08/19/augmented-reality-love-letter-pokemon-go/#gref>. Mayer, Andrew. “A Game Designer Explains Why ‘Pokémon Go’ Blew up (and What’s Next).” A Game Designer Explains Why ‘Pokémon Go’ Blew up (and What’s Next). Digital Trends, 01 Aug. 2016. Web. 18 Sept. 2016. <http://www.digitaltrends.com/gaming/pokmon-go-where-does-it-go-from-here/>. Hanke, John. “Three Years of Ingress and the Road for Niantic.” Medium. N.p., 28 Jan. 2016. Web. 18 Sept. 2016. <https://medium.com/@johnhanke/three-years-of-ingress-and-the-road-for-niantic-a991a2d6587#.fij2iuf4o>.